I am reading some papers by Don Norman, and one on “Distributed Cognition” (Norman, 1993) makes some very nice points about the value of large situation rooms and operations centres for providing a joint view of the current situation and actions being taken in complex environments such as power station control rooms and emergency response centres. I have been in such centres for real and training situations, for natural disaster response in Tokyo, for a nuclear power station in the UK and for search and rescue coordination in the UK and the USA. They are all set up to allow for people to gather round or have a view of screens and see information in a shared environment.. the operators and responders are not all looking at their own screen separately… though of course they do that to use specialised tools, information and communications which they bring to the shared space. In our work we have sought to replicate this sort of shared situation space, as a basis for human centric decision support. When we started to embody our technology in virtual worlds we wanted to replicate some of the benefits of this, and indeed provide a shared space for distributed participants, as is often the need in complex multinational emergencies. We are sometimes asked why we want to replicate rooms with walls when we are in virtual worlds, and I respond that we want the wall space for displays and distinct functional areas that everyone can remember and use. 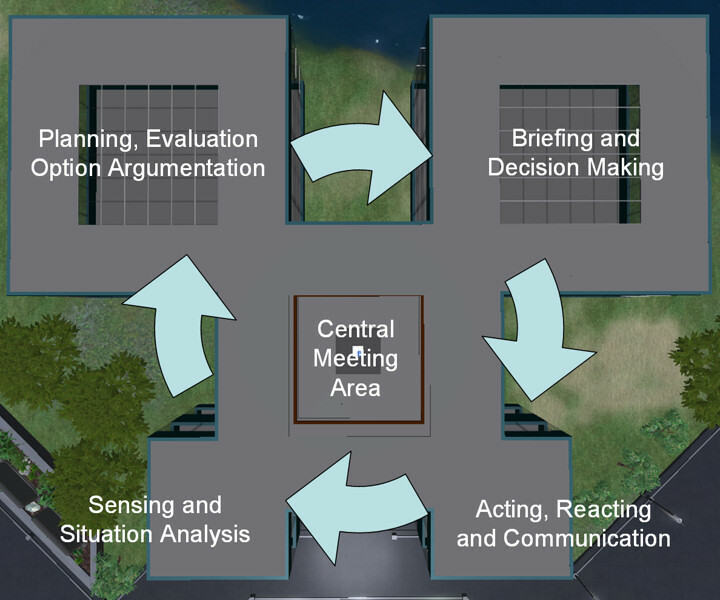 In our I-Rooms (http://openvce.net/iroom) we have a shared central space in which participants gather and communicate, and from which viewpoint they can direct their attention to any of four functional areas set in a cyclic pattern to allow for situation assessment, option exploration, briefing and external communications. It supports the OODA Loop (http://en.wikipedia.org/wiki/OODA_loop) as an underlying approach and lets us place human and intelligent systems support into a meaningful whole which all the participants can involve themselves in as appropriate. Reference: Norman (1993) Things that make us smart : defending human attributes in the age of the machine . Reading, Mass., Addison-Wesley Pub. Co. Chapter 6; Distributed Cognition (139 – 154). This entry was posted in IDEL11, ULOE11. Bookmark the permalink.